For the many people who live day to day with chronic pain, all avenues of life can be impacted. Chronic pain can originate from a number of conditions such as the result of a surgery, an injury, or an illness. Living with chronic pain is no easy feat. If the pain is not managed well, the pain can reach excruciating and debilitating levels. If the individual is not properly educated about their pain and ways or management, they can be left feeling lost, isolated and hopeless. Many who live with chronic pain will undoubtebly find that their physical activieties decrease as the pain progresses. They fear that they will aggrivate the pain or make their injury worse by engaging in any form of activity. 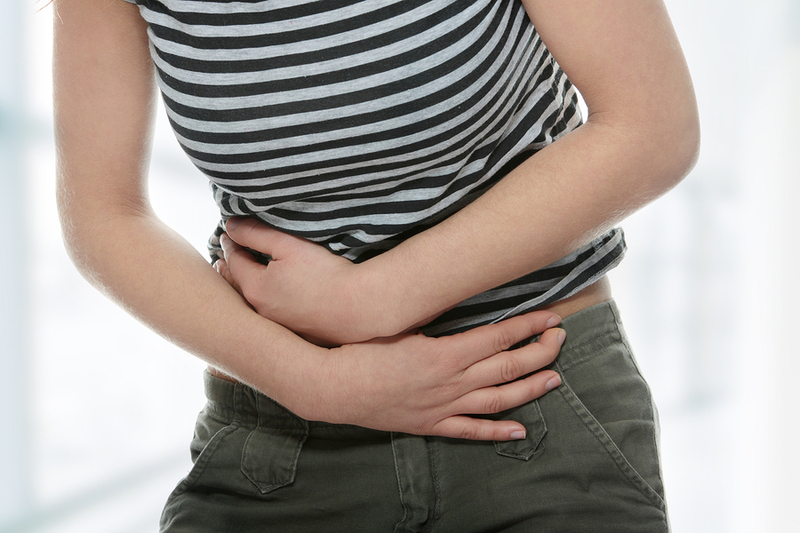 The instinct to “guard” the painful body part can cause the individual to immobilize parts of the body, inadvertantly making their condition worse. Because the pain affects so many aspects of life, pain can become the center of their living. Their mobility is not only affected, but also their mindset, their emotions, their external relationships as well as their self-worth can all be negatively affected. Pain can cause a chain reaction for many. 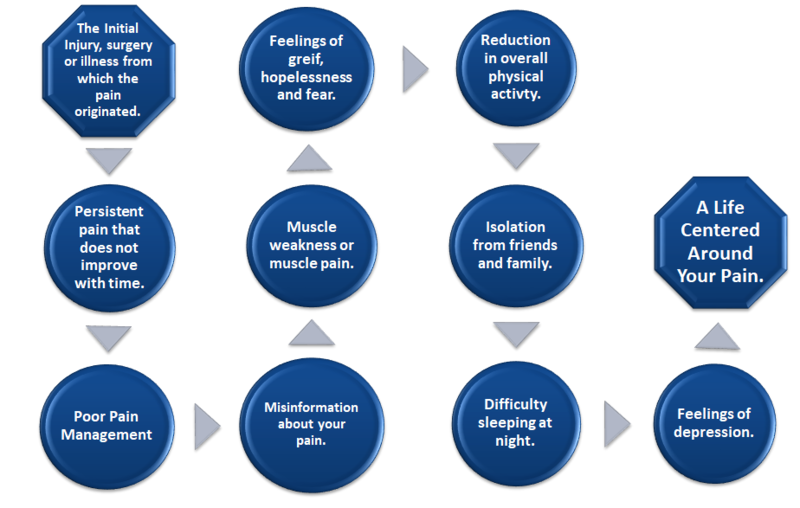 The Illustration below referred to as the “Chain of Chronic Pain” shows the various stages of the chain reaction. This illustration can be used tear down the stigma associated with chronic pain. It provides a visual aid to help those living with pain and their loved ones better understand the chain reaction into a life that is centered around the diagnosis. You can also use the “Chain of Chronic Pain” to create your own chain and illustrate how your own unique condition has impacted your life. It is not always easy for those around us to understand our own personal pain, especially if they have never dealt with chronic pain themselves before. By using the illustration below it offers an understanding of the progression of chronic pain that may not always be as clear when verbally explained. Also below, you will find the illustration titled “Breaking the Chain”. In this illustration you will see the steps to living a life that is centered around functioning despite the pain. 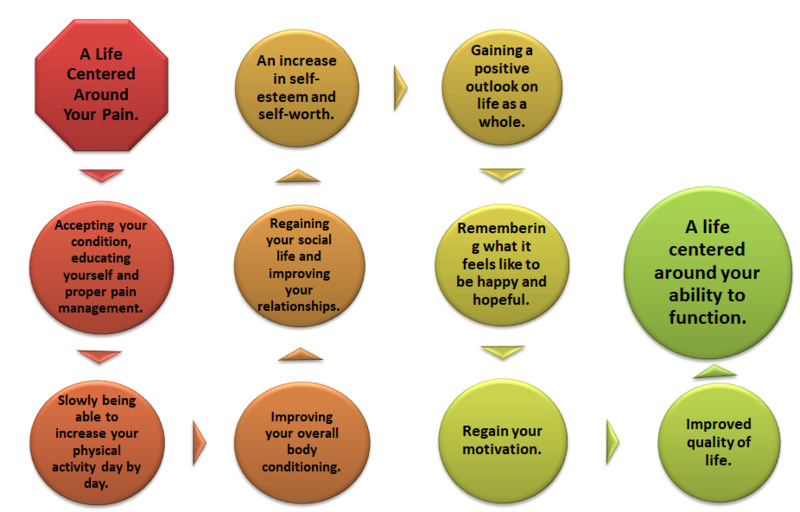 “Breaking the Chain” can be used as a visual aid to help on the path to better quality of life. Pain changes so many aspects of life. But this does not mean the pain should change the focus of your life. Use these visual aids to help the people around you understand where you are coming from and where you would like to be. Your doctors, your family and your friends can all benefit from a better understanding of you and the pain you live with everyday.